It can be hard to know what is going on in your local area and how you can access the support and services you need. The Community Navigator projects work in Edinburgh to advise people over the age of 65, their families or professionals on what groups and activities are out there. The staff will support you to find out what’s on in your local area and how you can access the support you need, in the way you want. TSB contacted Jen, Health in Mind's Community Navigator for the South East, to ask about what groups they could donate to in their local area. 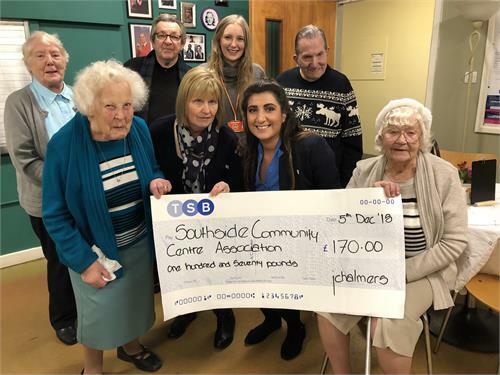 After Jen sent them a list of groups and services local to their branch on South Clerk Street, they decided to donate to the Over 60s Social Group in Southside Community Centre. The branch managed to raise £170 for the group to spend on a Christmas meal, and they were incredibly appreciative. Get in touch today to the LOOPs project to find out what’s going on near you!